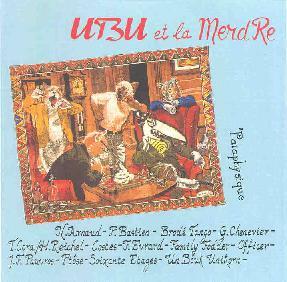 Various Artists - "Ubu Et La Merdre"
Now here's an interesting compilation. I'm unclear as to the theme as the extensive writing on the back cover and liner notes are in French, but it was originally released in 1989 and among it's contributors are Tom Cora and Guigou Chenevier. In Poly Sons seems to be yet another division of Musea Records. The reference point for much of this music is Etron Fou LeLoublan, Aksak Maboul, Henry Cow, but also electronica á la Kraftwerk, and even at times The Residents. Not all of these tracks worked for me, though all were intriguing, and some quite good. UnBouk Unikorn's contribution is a quirky, playful piece for horn, percussion, and voice. The rhythms are a bit start/stop, but this is used to good effect. Once again Etron Fou LeLoublan is the best analogy, though slightly more abstract than the Etrons. Soixante Etages offers up an interesting rocker with crunchy guitars and theatrical yelling vocals. Like an avant rock theater piece. The guitar blasts away accompanied by deep zheul-like bass, a free-wheeling sax, and even harmonica. It's a wild jam. Freeform but controlled. My favorite track on the disc and one I really wish was a bit longer. There are also some tracks that make interesting use of electronics. Jean-Francois Pauvros's track consists of a plodding combination of electronics, violin, and percussion. There's also a slow drunken Hawaiian guitar line to help throw a ringer into the mix. The vocals, like several of these tracks, sound like they're from some kind of theater work. Along these lines too is Brode Tango, with more varied vocals, and keyboards that remind me of the Residents' Mark Of The Mole, though it surprised me by finishing up as a good time acoustic pub dance song. Strange but fun. Pierre Bastien plays a whimsical tune with enjoyable vocals reminiscent of Dagmar Krause and Suzanne Lewis. Guigou Chenevier's track is, of course, everything you would expect from an Etron Fou track. And finally, my other favorite track is probably the most insane. Costes' 'song' features intense screaming vocals backed by circus styled horns. The vocals get downright evil making the whole atmosphere quite surreal. A wildly contrasting but intriguing combination of music and vocal mayhem. Overall, an interesting compilation and if you find the combination of analogies in the first paragraph to your liking then you would do well to pick this up. Soixante Etages is the one I plan to pursue further. Ubu Et La Merdre is distributed by In Poly Sons. You can visit their web site. Contact via snail mail at In Poly Sons; 1 Route Saint Urbain; 54110 Rosieres Aux Salines; France.